a9 Hub is a simple, browser-based, Google-like search-based application (SBA) powered by an open-source search engine that works within a company’s security policies. As a Unified Information Access (UIA) solution, a9 offers unique features aimed at drastically improving efficiency and collaboration among team members, allowing them to rapidly search for, find, view and act on any accessible data asset, keeping critical data at their fingertips. Alcove9 products maintain the same groups, roles, and access control lists (ACL) that are built into your native applications.. In this way, data security is retained while giving users search capability across multiple data silos. Since Alcove9 products inherit your security roles and responsibilities, there is no additional burden for the system administrator. Easy Search Results: No Source? No Format? No Problem. Typically, Part information exists in various formats across multiple repositories in a company. With Alcove9’s normalizing technology, the retrieved data is presented as a composite collection using standard or custom Part nomenclature and attributes. The significance is that users can search, find and retrieve data in a consistent manner without detailed knowledge of the source or format. 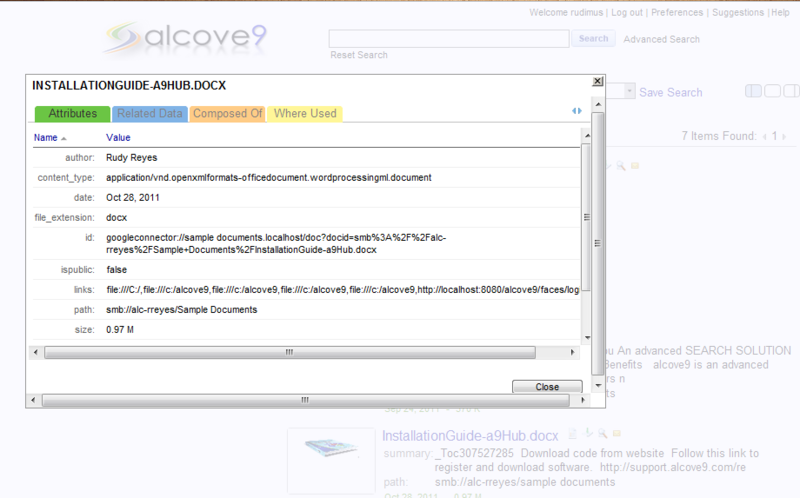 Alcove9 provides a single point-of-access via its a9 Hub to all enterprise data contained in multiple Product- and Part-oriented applications and repositories, including PDM/PLM, ERP, ECM, MES, RM and simple file structures (see a9 CADViz and a9 AppConnect). For example, a user searching for all relevant information about a part might find the latest design revision in PLM, a BOM in ERP, an Excel spreadsheet and a Word document – all in just one search. 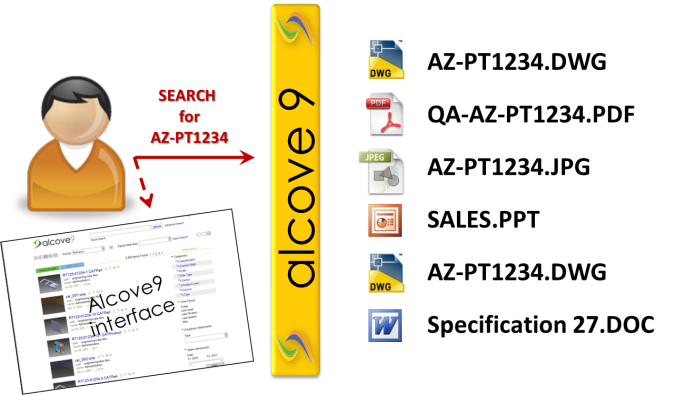 Alcove9’s UI can be configured to optimize searching results. The user organization can predefine colors, logos, layouts, refinements, saved searches and widget preferences. These options can be defined at either the enterprise and/ or the user level. To ensure that users have access to the latest and most current information, Alcove9 automatically and transparently captures changes in the organization’s enterprise data repositories and software applications. These changes can include the addition, modification or deletion of data and associated documents. The time interval for updating is user-defined. Alcove9’s architecture allows distribution of activities across multiple servers, if necessary, to provide required system performance. It works across multiple sites with thousands of users and millions of documents and still returns results in an average of 2 seconds. We call this The 2-Second Search Engine. Each search result has a Virtual Profile Card (VPC) attached to it. These cards contain information about the object’s attributes, related data, and assembly information – each with their own tab. Intuitive navigation with an object’s VPC provides greater visibility for users. 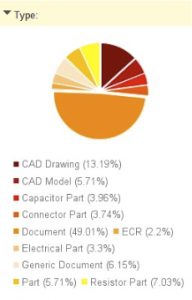 Each search item is analyzed for relationship and taxonomy data; for example, a user looking for “capacitors” could see information about capacitors organized by Type, Attributes, Supplier, or Content Source. Attributes: Information from an object’s properties, xref, or title block. Related Data: A list of similar data based on configurable preferences. Assembly Information: Where-used and composed-of information. 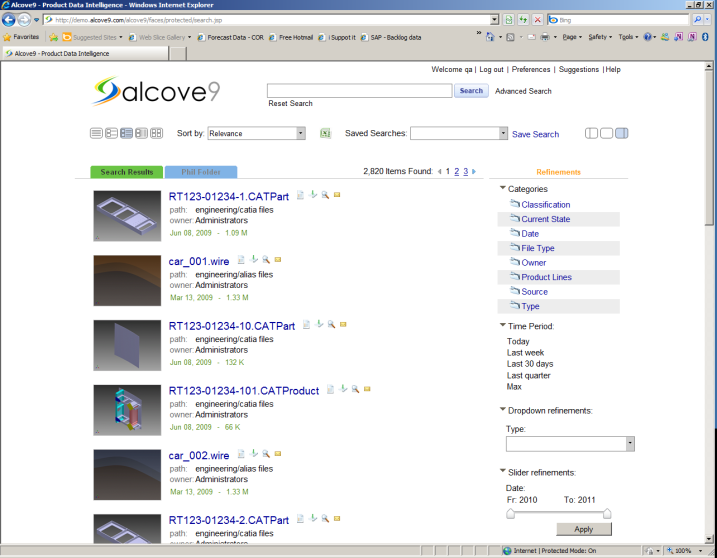 For CAD data (a9 CADViz), Alcove9 gives instant mapping of where-used and composed-of data for each Part returned in a search result. This relationship data can then be searched with one click, allowing users to find relevant Parts and product data within seconds. This allows users to intuitively drill down to various categories to quickly zero in on relevant Part information. Thumbnails are visual representations of the search object. They are typically the first page of a document or of a CAD drawing. This permits users to quickly see the presented data that they want to explore. Thumbnail visualization dramatically reduces search times, thereby improving user productivity. Intuitive search options provide search and discovery capabilities. Each search and each object has a trail or location that is visible for reference. Keyword searches can be refined based on advanced search options or pre-configured search refinements. Refinements can be assigned to many widgets that have been developed including drop down menus, slide bars, pie charts, and checklists. 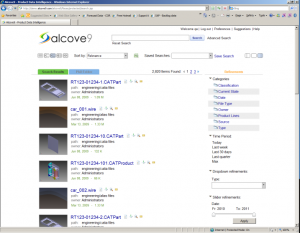 Alcove9 has an optional component, a9 CADViz, to view, annotate and mark up CAD files without the need to open the actual application where it is stored. Therefore, users can access data without a consumer license, giving the upstream or downstream users the ability to view, annotate or markup 3D models without having to wait for or disrupt the designer/engineer. Alcove9′s a9 AppConnect offers a number of application connectors for PLM, ECM and ERP, RM or MES systems.